Today is hound day at Midland Counties Championship show held at Staffordshire County Showground, ST18 0BD. Irish Wolfhounds are not a CC breed at this show, and are being judged by Ann Macaulay of the famous Scottish kennel, Gartlove. Ann has drawn an entry of 26 wolfhounds, which is pretty good for a champ show with no tickets. Results will be posted as the day progresses, and can be seen on the Fosse Data website. Last time Ann judged a championship show was at Scottish Kennel Club in August of 2012, Irish Wolfhounds do not have CC status at this show either. At that show Ann drew an entry of 17 and with only 1 absentee, found her BD in Achnacon Druid’s Apprentice at Stenhound, RBD was Marlaw Dubh Mac Tire, BB and BOB was Rivenhound Double Cream and RBB was Hibeck Hannah at Rivenhound. BPiB was not awarded as there were no puppies attending. Today sees the annual Irish Wolfhound of the Year competition. It’s a match show organised jointly by the Irish Wolfhound Club and the Irish Wolfhound Society to celebrate the very best of the Irish Wolfhounds seen in competition throughout the preceding year. To qualify for entry the wolfhound must have acheived a certain win or placing at a Championship show throughout the year. Full details of qualifying criteria can be seen on the WOTY 2018 facebook page. We’re very proud that several of our members hounds qualified and we wish them every success on the day. Go IWCoS!! What glorious sunshine we had today! A lovely day was had by all I think at Hound Association of Scotland Open show. The Irish Wolfhound Club of Scotland had sponsored the classes, and suggested Mandy Addington, affix Wolvebrigg, as the judge. 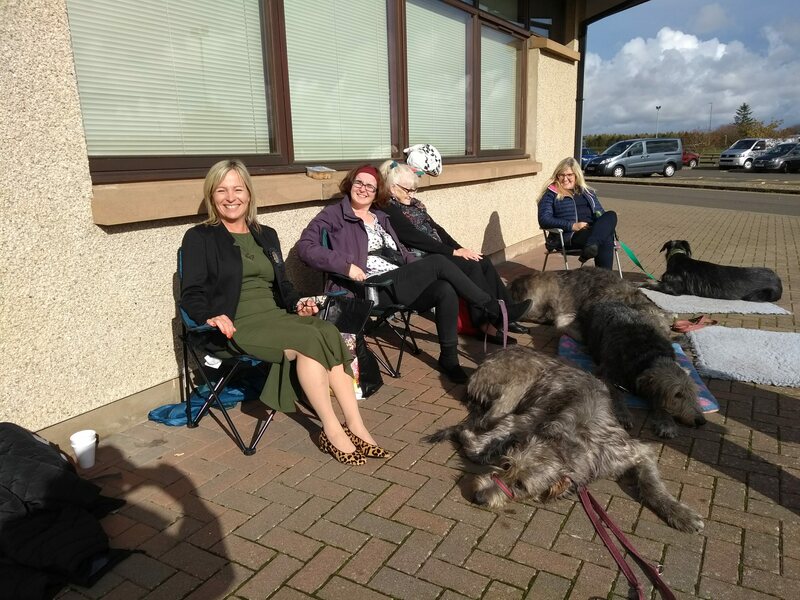 After judging was complete and everyone could relax (well, nearly everyone) we headed outside to put up chairs and roll out dog beds for a picnic in the sunshine (in Scotland, in October!!) while we waited to cheer Thor and Dolly on in BIS and BPIS. The European Dog Show is being held in Poland just now alongside the 80th Anniversary show of the Polish Kennel Club. 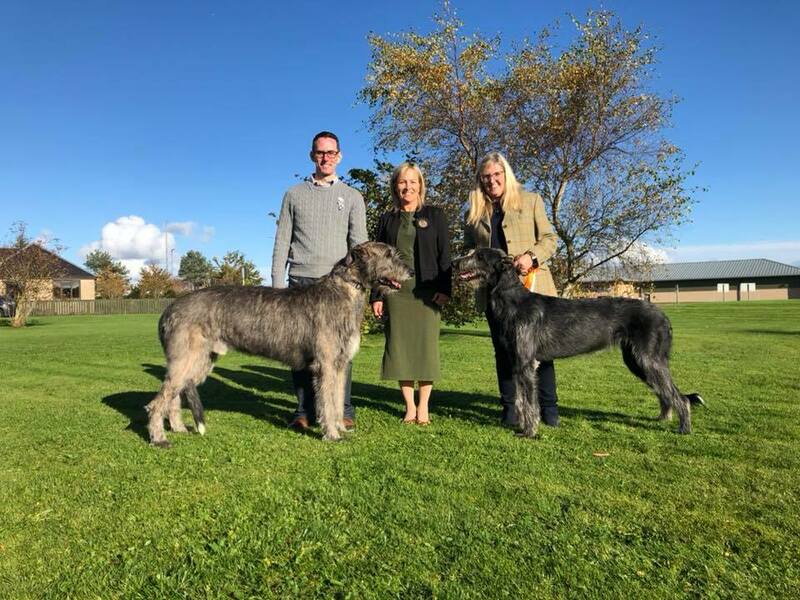 Sighthound (Group 10 under the FCI system) day was yesterday and you can find the full Irish Wolfhound results here. Best of Breed from 38 entries at the EDS was Glor Na Gael Dyfan, bred in Hungary by Czilla and Timor Juhasz. At the Polish KC show on Thursday Best of Breed Irish Wolfhound was given to Sapwoods After All from 7 entries. Full results here. Congratulations to all who attended. Website maintained by Irish Wolfhound Club of Scotland. Copyright 2018.